We are rapidly approaching the growing season of two of my favorite foods: strawberries and rhubarb. Our local u-pick farmstand already has them available, but I haven't been able to get away to get my hands on some quite yet, I have big plans and dreams of overflowing buckets of strawberries that I plan to make a reality next weekend...now I just have to cull my cravings until then! After I pick strawberries I usually make some sort of dessert, freeze a bunch of them and make a freezer jam. 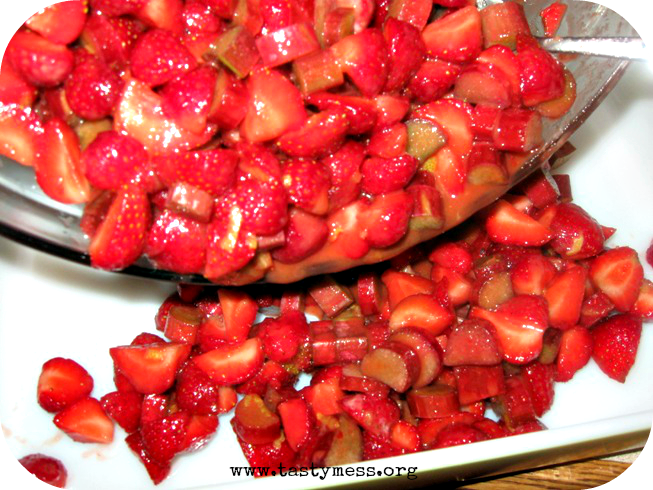 This simple strawberry rhubarb crisp is a favorite and so easy to put together after hours bending over and picking strawberries in a field! I stumbled upon it in my recipe archives and I think I made it for the first time back in 2011, so I can't wait to bake up a batch of this addicting stuff in just a few weeks! Crumble the topping in chunky "blobs" over the filling. Bake until the filling is hot and bubbly and the topping looks crispy and light brown - about 30 minutes. Serve warm with whipped cream or ice cream and good luck trying not to eat the entire pan in one sitting!